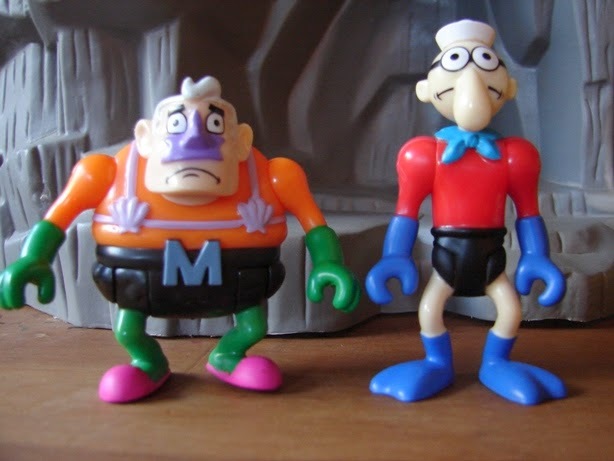 Toyriffic: Imaginext Mermaid Man and Barnacle Boy action figures! 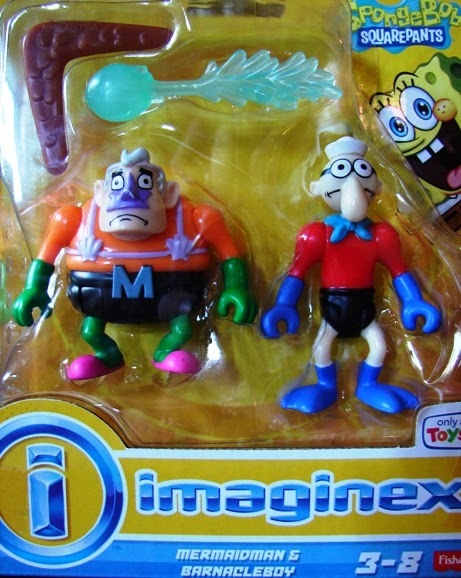 Imaginext Mermaid Man and Barnacle Boy action figures! Mermaid Man and Barnacle Boy! I have never been secretive in my dislike for Spongebob Squarepants. The cartoon is ok I suppose, and the character designs are cute. But THAT VOICE! Good lord it's so grating. But one thing I have always loved about the show (or should I say two things) are Mermaid Man and Barnacle Boy. 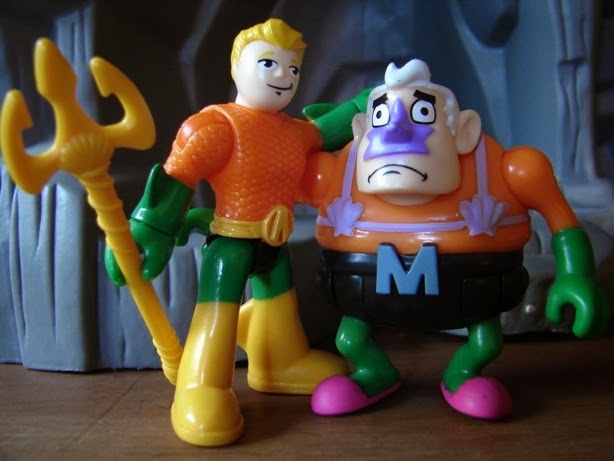 Parodying not only the most obvious pair Aquaman and Aqualad, Mermaid Man and Barnacle Boy are also homages to Batman and Robin (in the form of television's Adam West and Burt Ward) and maybe even The Skipper and Gilligan. With a tiny bit of 'Little Mermaid' thrown in. 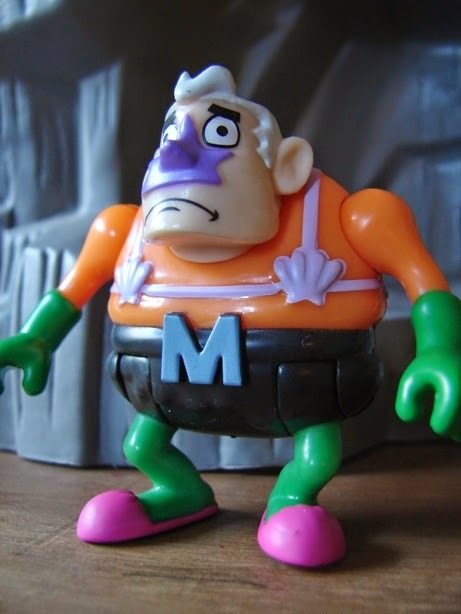 Voiced in the show by the not-at-all-grating Ernest Borgnine (Rest in Peace) and Tim Conway, Mermaid Man and Barnacle Boy are retired superheroes in the undersea world of Bikini Bottom. 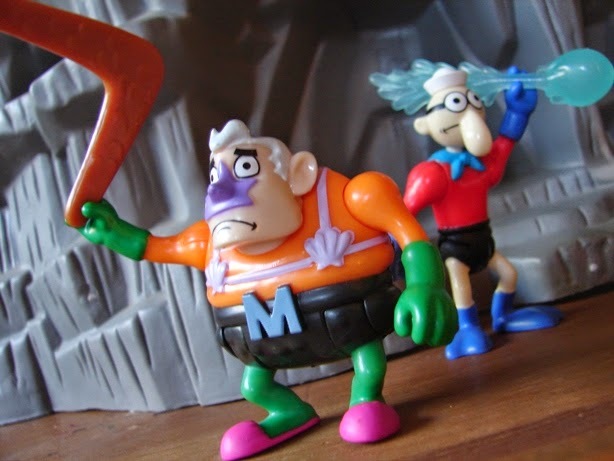 The Imaginext Mermaid Man and Barnacle Boy action figures are a Toys R Us exclusive, and have just recently started appearing on their shelves. These guys are wonderfully designed, fitting right into the Imaginext aesthetic while representing their cartoon designs almost perfectly. 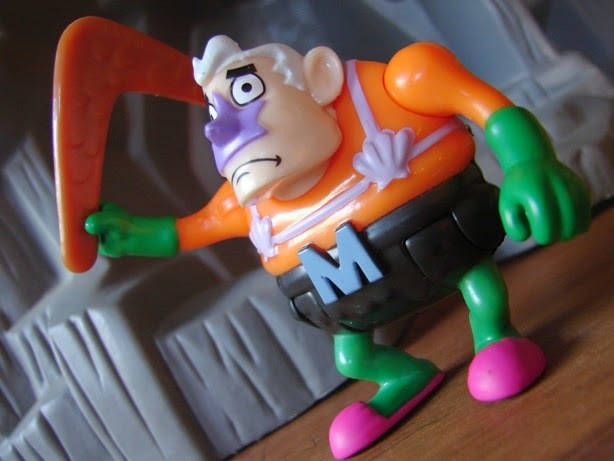 Mermaid Man has swivel jointed shoulders and his legs swing forward in unison. About as much articulation as you can expect from an old dude like him! 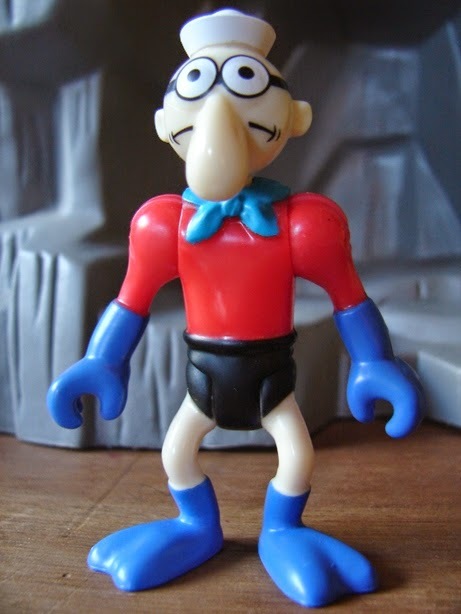 Barnacle Boy has the same articulation as Mermaid Man. His head might turn, but I'm not going to force it. 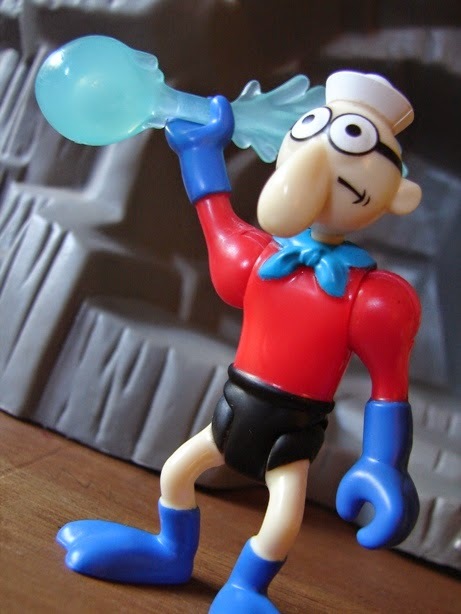 ...and Barnacle Boy comes with his Water Ball. I absolutely adore these two figures, as much for their association with Aquaman as with their association with Adam West and Burt Ward. They are conceptually wonderful and hilariously designed. Even if you aren't a fan of Spongebob, you owe it to yourself to track these guys down. Those are pretty neat! They are the only thing about that show that is redeeming in any way. I almost totally agree with you, although I kind of like the squirrel Sandy Cheeks too. These are cool Eric i really like those characters on the show i might have to see about getting a set for myself soon. And Spongebob isn't all that bad watch the "Band Geeks" Episode it's great. I know it has had it's moments. My wife loves it. I've just seen too many episodes where Spongebob and Patrick are acting so stupidly that I tend to tune it out now as force of habit! I'm a HUGE Spongebob Fan. It draws influences from all over the map, and it never feels tired or unoriginal. From the first season to now, they keep finding new ridiculous stories to tell and don't shy away from the absurd, the psychedelic, or the classic schticks of animation. With that mouthful having been said: I WANT THESE!!! They look great. 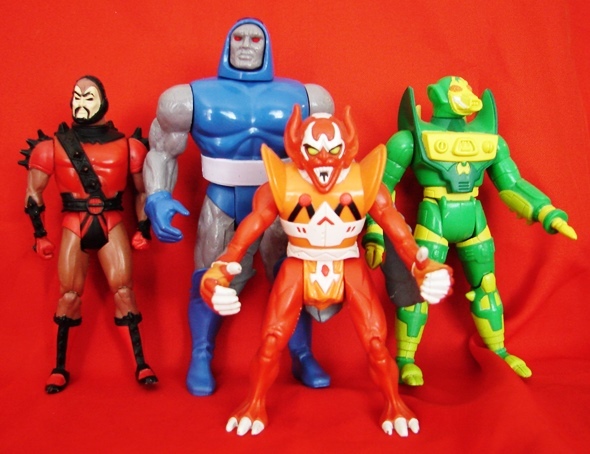 I while I am only the most tangential Imaginext collector, in that I pick and choose only a VERY FEW pieces that I like here or there (and almost nothing else)... The Spongebob line has definitely created some must-haves. I am also wild to track down a Flying Dutchman/Pirate Patrick 2-pack, and then I will finally pick up that Flying Dutchman I just haven't pulled the trigger on yet. The Pirate Patrick/Flying Dutchman are in the same release as this one, I saw them on the shelf right behind these guys!